There are so many questions that come with caring for a small child. When should I feed him? How often does she need to be changed? Is he too hot in that outfit? Does she need a blanket? 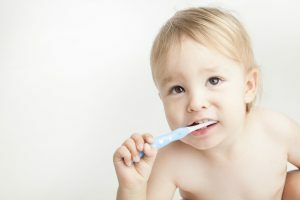 One common question that Monrovia pediatric dentist Dr. Q hears from her pediatric patients’ parents is, “How should I clean my child’s baby teeth?” Read on for tips from Dr. Q on how to care for your child’s baby teeth. Should I Do Anything Before My Baby Starts Teething? The answer to this question is definitely, “Yes!” Even before your baby starts teething, pediatric dentists like Dr. Q recommend you should wipe his or her gums down with a warm, wet washcloth or piece of gauze to prevent bacteria growing from food debris. If you don’t, bacteria cause plaque, leading to gum disease in your little one. And we know you don’t want that happening. My Baby is Teething. When Should I Start Brushing His or Her Teeth? According to Monrovia pediatric dentist Dr. Q, you should start brushing your baby’s teeth twice a day as soon as he or she has one tooth. You can use a thimble-like device that goes over your index finger to brush the tooth and gums, or a soft toothbrush to clean your child’s new teeth. When Do I Need to Start Flossing My Baby’s Teeth? When your son or daughter has two teeth that are touching each other, you should start flossing them. While some parents find traditional floss is easiest to use, others like pre-threaded flossers. Find out which option works best for your little one, and then floss every day. Remember, good oral hygiene habits start young. Fluoride Toothpaste or Non-Fluoride Toothpaste. What’s the Right Decision for Me? Pediatric dentists agree that fluoride is a very important part of dental health. It’s your child’s first line of defense against tooth decay, and can even reverse early tooth decay. And, the amount of fluoride your child consumes when he or she has baby teeth will affect the healthiness of their permanent teeth, too. With that being said, swallowing fluoride toothpaste can lead to a tummy ache or discolored teeth. Kids who are too young to know how to spit out their toothpaste should use training toothpaste – which is fluoride free. Once your child is old enough to spit out his or her toothpaste, he or she can switch to fluoride toothpaste. Even if your child does not use fluoride toothpaste, he or she may be getting safe, low-doses of fluoride from tap water. However, if your child does not use fluoride toothpaste and does not drink tap water, Monrovia pediatric dentist Dr. Q recommends you ask for fluoride supplements, which can be taken as early as 6 months of age. It’s recommended that all children see a pediatric dentist by age 1, and then have bi-annual check-ups. If you need to schedule an appointment with a pediatric dentist for your child, call Dr. Q at her Monrovia office at (626) 599-9819 today.